Aardvark Painting is your Chicago Epoxy Flooring Contractors specializing in all types of Decorative Epoxy floors including flake/Chip Epoxy floors, they have become a popular choice to transform an oil stained garage into a living space impervious to all auto fluids. 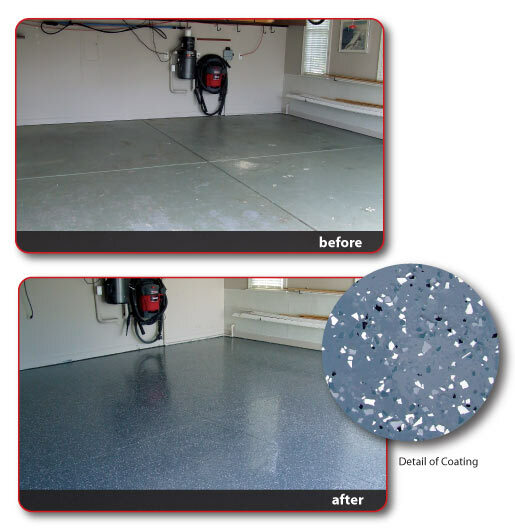 Our Epoxy floor process utilizes advanced formulation epoxies, urethanes and colored vinyl flakes/chips to cover any concrete surface with a granite-like finish. This process is now being applied in garages, showrooms, grocery stores and any other place you want concrete sealed permanently. We use only the finest 100% Solid Epoxy products with zero VOC (Volatical Organic Content)and applies them with uncompromised surface preparation and installation. Our process always begins with preparing the surface by Diamond grinding or Shot blasting is process is the most important part of the job and often not performed by shoddy or inexperienced contractors, call Aardvark Painting Your premier Chicago Epoxy flooring Contractor. Safe to use & EPA approved.